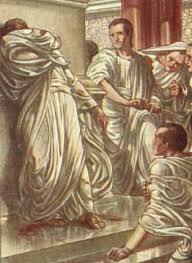 Byrne's English 12AP: Today in Literature: Have you read Julius Ceasar? she asked. Today in Literature: Have you read Julius Ceasar? she asked. Today is the infamous Ides of March. Two thousand fifty-two years ago on this day, the Roman emperor Julius Caesar was stabbed to death by senators who called themselves the Liberatores (Liberators) and claimed they were preserving the integrity of the Roman system. Although Caesar ostensibly refused to be named king, he had no qualms about stamping his face on coins (a spot previously reserved for gods), and he happily assumed the title "dictator for life" in February of 44 B.C.E., just a month before his assassination. The most famous of the Liberators is Marcus Brutus, a man personally connected to Caesar. Brutus's mother, Servilia, was one of Caesar's lovers, and Caesar singled Brutus out as a young man of promise and gave him a government position. It's not certain why Brutus conspired to kill Caesar, but the young man did come from a family of anti-authoritarians — his ancestor Junius Brutus overthrew the last king of Rome in 509 B.C.E. Of course, William Shakespeare wrote a play about this. In it, Ceasar is told to "Beware the Ides of March"(Act 1, sc.ii) because, well, something bad was going to happen. Like his bff Brutus was a backstabber. Literally. After Brutus had killed Ceasar, he gave a big funeral speech. "I come to bury Ceasar, not to praise him" he told the mob. "I loved him, but loved Rome more" he also said. Deflection: a useful political tool. Have we witnessed any other political deflections in the Shakespearean works read so far this year?